She’s talking about the National Hispana Leadership Institute (NHLI) and its Executive Leadership Program, which brings together 22 professional women for intensive, nine month-long leadership training. The program has been a smashing success since its inception in 1987. Nearly 50 percent of its graduates currently earn over $100,000. A third hold executive-level positions, compared to 15 percent before undergoing the training, and eight out of ten program alumnae credit it with changing their lives forever and “for the better.” An overwhelming majority (80 percent) say the program has made them “more effective leaders and professionals,” and more than half serve on government commissions or special task forces. Housed in a tiny office in suburban Virginia with a stunning and expansive view of the monuments across the river in Washington, D.C., NHLI has a new president, Cristina López. Prior to her appointment in July, she served as Deputy Executive Director of the Center for Community Change (CCC), a grassroots community organizing group. López grew up between Miami and Cape Canaveral, where her father worked for NASA.“I got to see a lot of farmworkers in Florida. I got to see the disparity early on. I felt like I wanted to work in my community and give back to my community.” After graduating from the University of South Florida, she traveled back to Colombia to teach school. Five years, López returned to the U.S. to attend graduate school and work for the Washington-based National Council of La Raza (NCLR), the nation’s largest Latino organization. “My experience growing up with the farmworkers in Florida, and my experience working at NCLR really shaped my view a lot in terms of how I feel about being an advocate for the Hispanic community. That’s very important to me,” López says. Having a greater impact may sound like a buzzword, but for López and other NHLIstas, it is a mantra they live by. “We want to promote strong, visible and influential Latinas,” López says. Several years ago, the Institute founded a leadership program called Latinas: Learning to Lead. It brings up-and-coming Hispanic women aged 17-22 to a week-long summer program in Washington, D.C. “We started thinking, we need to get them younger, to start them out younger in leadership training,” López adds. “To get them to start thinking about future career paths and start thinking about giving back to the community at an early age. NHLI also sponsors leadership empowerment conferences that function as half-day programs in various cities across the country to introduce Latinas to potential role models and mentors. The NHLI is currently looking to expand the program to a full day and beyond its current sessions in five cities. 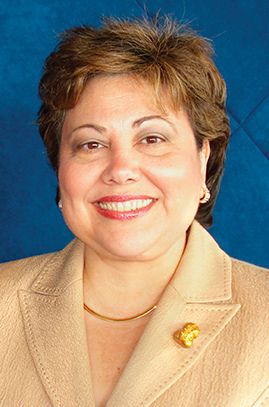 Patricia Guadalupe is a Washington, DC-based writer and editor of Hispanic Link.